Like yin and yang, old and new, woman and man, nothing is really whole unless it’s the product of polar opposites. All the way through the manufacturing process for making Paul Penders products, you can see the relationships between these two primal forces – Nature and Science. When they combine in the right way, the result can be true Beauty. On the one hand, we seek out Nature’s gifts – the herbs, spices and oils. The wisdom of ancient traditions informs our choices. When we learn of a special plant that has been used for centuries for beauty care – like the Kigelia from Africa and Pegaga found in Southeast Asia – then we try to understand the benefits and why it has been so effective. That’s where the Science steps in. As one of the very few small cosmetics manufacturers that maintains its own R&D department, our scientists research, measure, test, experiment, mix and match to make new formulas based on old traditions. The benefits available in Nature can now be shared – and are verified by Science to enhance Beauty. It really is a very happy marriage! 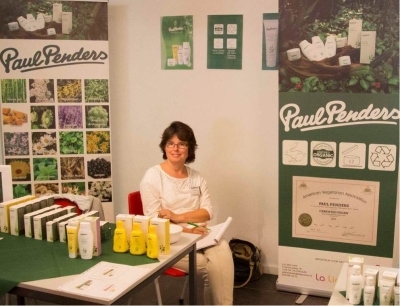 From all over the world, pure natural ingredients arrive every day at the Paul Penders warehouse to be transformed into natural herbal beauty products of the highest quality. An almost endless series of inspections begins to ensure the safety and quality of the products we make from start to finish. A first inspection is done to be sure the supplier has sent exactly what was ordered It is up to our hardworking warehouse staff to inspect and inventory all shipments in and out. The ingredients to be used that day are carefully collected from storage and inspected again to be sure their containers did not crack or break in transit and the contents have remained pure and clean. Then our lab team gets to work mixing up small batches to carry out the requests from our distributors. “Total Quality Assurance” is a step-by-step process with many checks along the way. Under special laboratory conditions, each batch is carefully measured, mixed, and once again — inspected for quality. Checks have to be done – and done again – to be sure products meet both governmental regulations and our own exacting standards. Our chemists have designed a special blending way of preparing the products which helps keep the freshness and prevents unexpected changes due to heating. They double check everything to be sure the new batch meets their exacting standards. Once the batch is ready, it will be tested once more by our international quality lab and get certified. Then the fresh, new product is carefully poured into sterile containers. These bottles, jars or ampules of Paul Penders products are slipped into their specially designed packages. Final counts and inspections complete the process. The packages then go into their appropriate shipping boxes, mailing labels are put on – and off go these carefully made, highest quality products to our distributors in countries all over the globe. Their safety –and yours — is assured at every step along the way. Professional toxicologist James Midgley is engaged by our company to provide an “outside eye” on all the ingredients, formulas, and the manufacturing process to help ensure that we deliver the safest and highest quality products. It can be a difficult, expensive, and time-consuming effort to receive government approvals for beauty products. New studies by scientists and reports by doctors come out almost every day in the cosmetics field about harmful contaminants and ingredients that have caused sensitivities or even illness – and then laws are changed. GMP, says James, stands for Good Manufacturing Practice. “It’s a legal term used by the European Commission community to determine safety for pharmaceuticals and cosmetics.” As the Safety Assessor, he looks at the MSDS – the “manufacturer’s safety data sheet” which lists the limits on what can be used in a product. You might expect that a Safety Assessor would have a certain serious way of living his life. Yet James Midgley’s unique personality makes it a real pleasure to know him. He is a great outgoing and spontaneous person, living life to its fullest. James worked in pharmaceuticals as a quality manager for Boots Pharmaceuticals and Reckitt Benckiser factories, the makers of household local brands that you may know. “USE AS INTENDED!” We know he’s right! When used as intended, thanks to our extensive Quality Assurance process, we can reassure our customers that all of the Paul Penders line of beauty products for hair and skin are completely safe for human use! Across the planet, Paul Penders’ distributors come up with exciting and creative ways to showcase our special products. With our recent designation as certified for use by vegetarians and vegans by the American Vegetarian Association (AVA), what better way to spread the good word than to partner with local establishments that specialize in vegetarian products? A first ‘demonstration day’ was held at the vegetarian store, Veggie4U, in The Netherlands on a recent Saturday. A Dutch tradition, a ‘braderie’ or street market, lined the main street of The Hague (Weimarstraat). Local shopkeepers set up a booth outside their front doors and invited customers inside. A Paul Penders promotional poster referred to the on-going demonstration in the back of the store. In communities all over the world, more and more people are ‘turning veggie’ as they realize the health benefits of consuming vegetables and the many cruelties found in the mass market industries which use animal products. In almost every aspect of life — from the food we eat to the personal care products we use – we have opportunities to stop cruelty to animals and improve our lives. September 2013 Please click on the links to read the full story! Beautiful on the inside as well as the outside, she’s one of the People We Admire: Brigitte Bardot, animal rights activist. Her stand against cruelty to animals has helped stop bullfights in many places. Her foundation has donated thousands to animal welfare organizations and helped millions of animals. Why Go Natural? Over many years of working in the beauty world, Paul learned that beautiful skin really has not much to do with science or secret formulas. We’ve got lots of great tips in our series about Your Beautiful Skin. One “secret” ingredient used by beauties all over the world for hair and skin care grows only in the tropics. We grow some at our home at The Ocean Residence Langkawi. Learn more about The PP Organic Herbal Garden – Coconut. Paul Penders has worked with hair almost all his life – from early days in his family’s hair salon in the Netherlands to training in Paris to creating shampoos and other haircare formulas for forty years. One thing he has learned over the years: your hair reflects your life. Read more about how Your Beautiful Hair reflects Stress in your Life. How many of us spend our 16th birthday changing the world? Speaking out at the U.N on behalf of education for women and girls, Malala’s moving words were inspiring. Doesn’t she give you Hope for the Next Generation? Circles symbolize and link the feelings of motherly love with our round planet, and Mother Nature with my own mother. Found everywhere in Nature and in Art, somehow there is nothing more beautiful than sharing a Circle of Love. Meet Brenda – The Typical Paul Penders Customer. Are you like Brenda? She cares about animals and the planet and makes the healthiest choices she can. She educates herself about personal care products for herself and her family. She chooses to use only natural herbal products that are cruelty-free, never tested on animals and contain no animal products. She’s a 21st Century woman!